San Ramon Valley High School. San Ramon Valley High School is a four-year public high school located in the East Bay neighborhood of Danville, California, United States. It is a part of the San Ramon Valley Unified School District. It is a National Blue Ribbon school from the Blue Ribbon Schools Program as well as a California Distinguished School. SRVHS's cross town rival is Monte Vista High School. On July 9, 2009, construction workers unearthed the remains of a Native American while working on the new gymnasium, and construction was halted for five days. Archaeologists claim the main camp was located six miles away and that finding skeletal remains such a distance from the camp was unusual; however, similar remains were discovered during repairs of the nearby I-680 freeway. More remains were unearthed soon after. In all, the remains of more than two dozen Native Americans were found. It is believed that the location was a burial ground. 1.8% of the students were eligible for free or reduced lunch. Jason Lucash – inventor and founder of Origaudio, Time's Top 50 Inventions of 2009; successful participant on ABC's show Shark Tank, and Entrepreneur's 2012 "Entrepreneur of the Year"
^ "Sam Ramon Valley High". National Center for Education Statistics. Retrieved October 29, 2018. ^ "GNIS Detail - San Ramon Valley High School". Geographic Names Information System. United States Geological Survey. 19 January 1981. Retrieved 8 April 2010. ^ "AP Program – Counseling Department – San Ramon Valley High School". www.srvhs.net. Retrieved 2018-02-25. ^ "East Bay Athletic League (EBAL)". www.ebalca.org. Retrieved 2018-02-25. 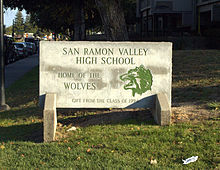 ^ "San Ramon Valley High School". www.srvhs.net. Retrieved 2018-02-25. ^ Barney, Chuck (6 September 2016). "Danville's D'Arcy Carden: In heaven in new NBC comedy 'The Good Place'". Mercury News. Retrieved 2016-10-16.